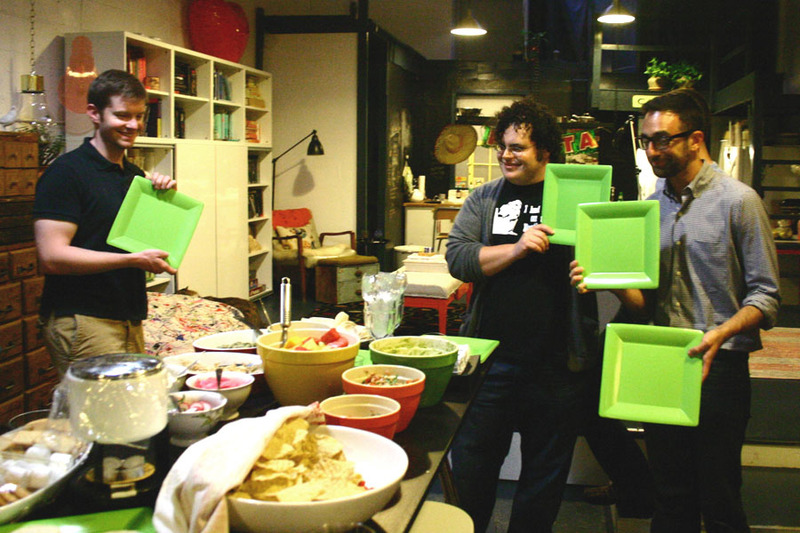 Throw a Baby Shower…for a Dude! I have no idea why they are holding up their plates like that...but aren't they cute?! 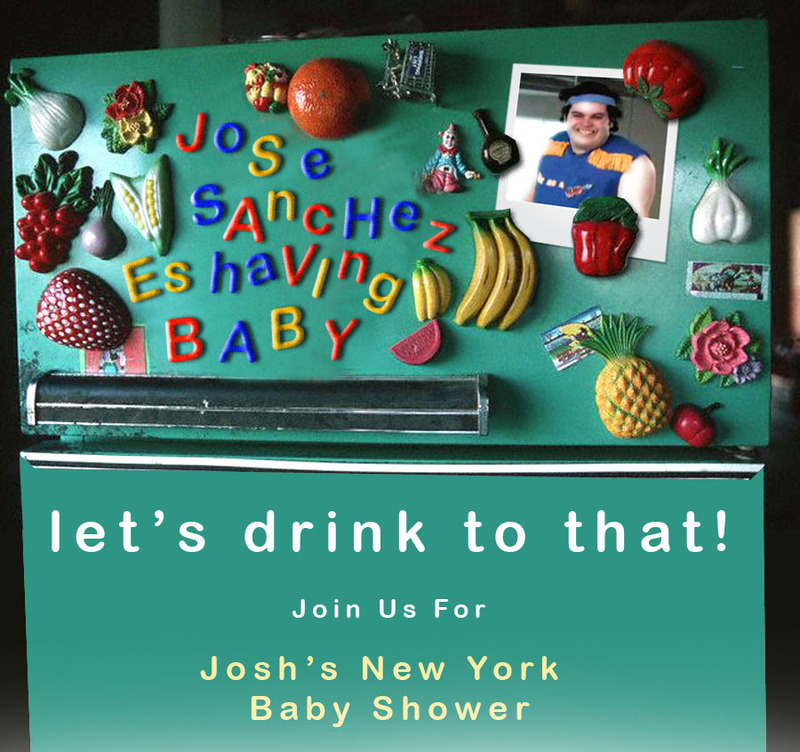 Our brilliantly funny friend Josh is an expecting father, so we decided to throw him a shower while he’s working in New York. Even though Mom couldn’t fly out, we thought it was still fitting to celebrate with a small group of close friends that wouldn’t be able to make it to Los Angeles for an official celebration. One of our favorite Josh “characters” is Jose Sanchez, a ridiculous workout guru, so we thought it would be fun to create the theme around that. Somewhere between a casual Evite invitation and a printed invitation are emailed versions like this one that I made in Photoshop. If you don’t know how to use that program, you can always use a Word document with clip art. Just be sure that you “save as” a type of file everyone can open like a JPG or PDF. The key to any successful party is the planning process. No one wants to see you sweat, so make a schedule that allows you to enjoy your party. Make sure that a decent amount of prep can be done the day before and NEVER buy your groceries and start everything the day of! 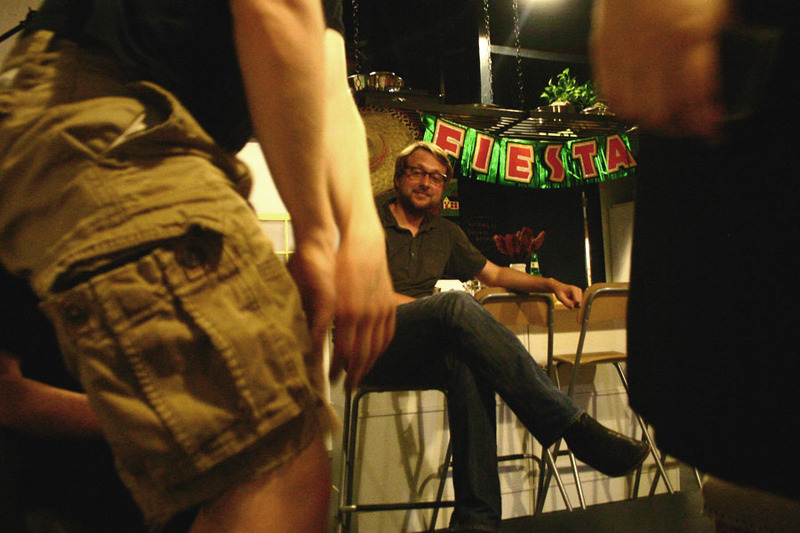 Jeff and I have thrown over 30 parties in the past 4 years and we have it down to a science. We always make the grocery list a week ahead, shop a few days before and spread the prepping out between the day before and the day of the party. OCD much? 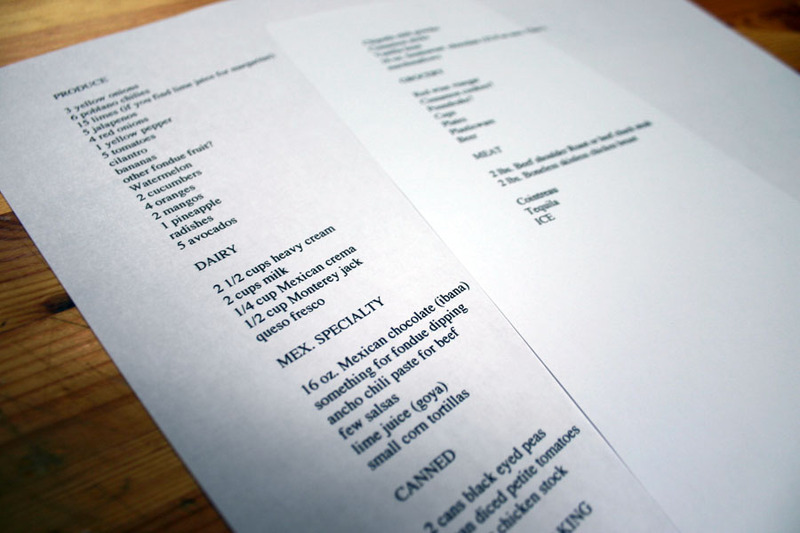 Organize your grocery list by your grocery store aisles. Don't look at me like that. I KNOW you know the aisles by heart too. No, we are not perfect, Josh. We did, indeed, over steam this tortilla...thanks for showing me that. Mexican fruit salad: Watermelon, Cucumber, Oranges, Mango, Pineapple, Lime juice, sprinkle of salt. Friday night: Make beef, Chicken, Rajas (minus the cream and cheese), Pico de gallo, Texas Caviar, and pickled onions. (Always go ahead and put pre-prepped items in the bowl or dish you are going to serve them in to cut down on time and dishes) Shred cheese for Rajas and store in a ziplock. Put salsa verde, queso cotija and chipotle sauce in serving bowls and refrigerate. Plate cookies and marshmallows, cover with plastic wrap and store away. Juice limes for margarita “punch” and refrigerate. 5:30pm: Make chocolate and keep at room temp in a fondue pot covered with plastic wrap. 6:50pm: Put beef, chicken, and rajas in pans with lids and put tortillas in a steamer over a pot a water to reheat but keep the stove off! 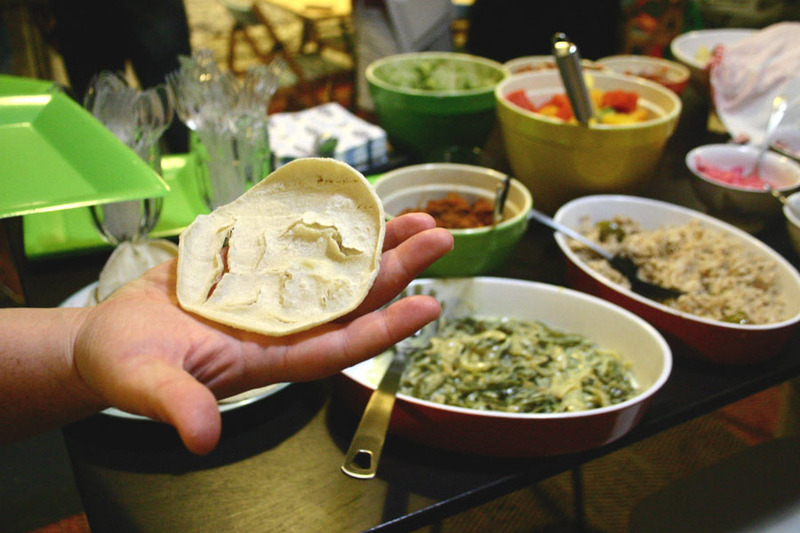 7:00pm: Greet guests and get them set up with a margarita and show them over to the chips and dips. 7:30pm:Reheat beef, chicken, and rajas. Add cream and cheese to rajas. Steam tortillas. Put back in dishes and serve! 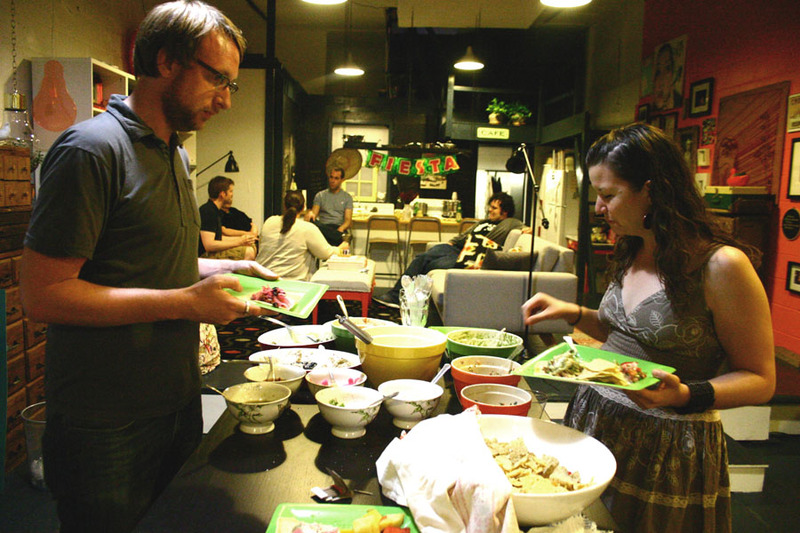 When everyone goes for seconds on tacos, light the fondue tea lights, slice pears and bananas and plate both with cherries. Jeff seems pleased that Ben was my co-captain for this party! This might seem a little obsessive, but it does work. Everyone feels comfortable and at ease when you aren’t running around in the kitchen trying to finish everything an hour into the party. You truly come across as a star host or hostess. Try the system out next time you have a small dinner for friends or a huge cocktail party and you’ll never go back! Always spruce up your water pitcher. Add mint, or cucumber, or lemon slices. Play around with different subtle flavors, but never let it be boring! Simplify your menu. A few well made dishes are better than a bunch of things that don’t really “go” together. Skip the cheap looking paper plates and hit up a party store for elegant square ones. They are still inexpensive but look much better on your table!